Back in November last year, Holly Wong of Seeking Delicious and I celebrated our birthdays with 9 of our friends at The Bazaar by Jose Andres. One of my friends came as far as Toronto — Canada that is — and one from Thousand Oaks.I’ll have to say my review of The Bazaar will come in Part I and Part II and you will understand why once you’ve read this review in its entirety. For some reason, traffic was horrific that evening and it took us about 2 hours to get from OC to Beverly Hills so our guests arrived sporadically. While waiting, several of us ordered some drinks, including Passion Fruit Up! ($16) which comprised of orange rum, passion fruit and ginger-laurel syrup, topped with passion fruit foam. It was like drinking a dessert, aromatic with a perfect combination of sweet and tart flavors. Holly and Mahesh decided to go all out and partake in the table side service drink Caipirinha ($20). A guy comes around with a cart and starts concocting this drink consisting of Brazilian cachaça, fresh lime and sugar and freezes it as you watch, using liquid nitrogen.The Caipirinha was good but was it really worth the $20 price tag? I’ll let you be the judge of that. We start with a yogurt tamarind star anise dip ($10) served with sweet potato chips in a paper bag. A few serves were placed on the table and everyone was to share. However, we quickly ran out of the sweet potato chips and I asked for more. Our next course arrived in the form of American caviar cone ($9/per person) — we were each presented with a baby cone filled with caviar and a lovely foam. This was one of our favorites of the evening. 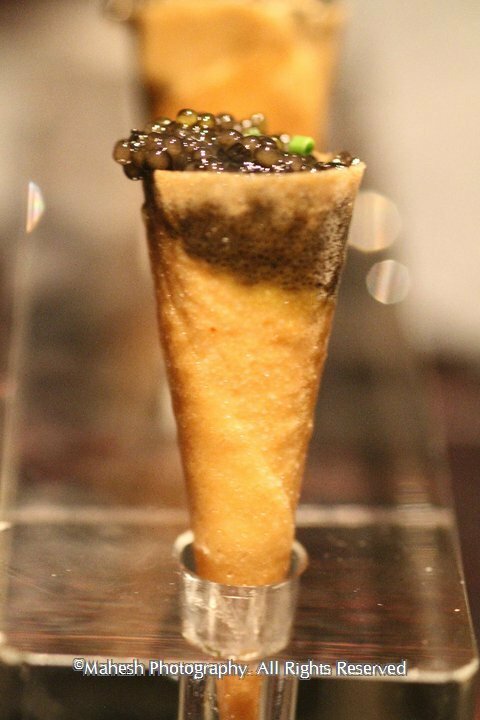 The crispy cone was a wonderful contrast to the gooey, salty, poppy texture of the caviar. 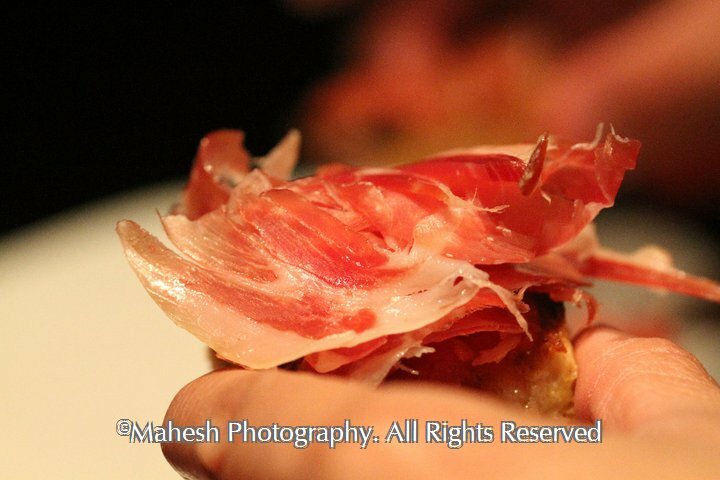 Jamón Ibérico Fermin (2 oz) $28 was definitely a hit with everyone. Perfectly salty dry cured, free-range Ibérico ham served with Catalan roasted bread and a tomato spread. This is very traditional and one of my favorite Spanish tapa. For the longest time, flesh of the black pig was not allowed to be imported into the USA and I knew people who would try to “smuggle” it in their luggage from Spain. Boy was I glad when they lifted that ban! Our next item was mussels in vinegar, olive oil and pimenton ($8) served in a tin. I know this is traditional and served at tapas bars across Spain, but I didn’t enjoy this at all. Neither did I like the King crab, raspberries in a raspberry vinegar ($18), also served in a tin. The raspberries completely masked the sweetness of the crab which was a real shame! We were all perplexed as to why we were eating tuna ceviche and tuna roll ($15) because it reminded us of something we’d eat in a Japanese restaurant. Even so, this was very refreshing, tuna was very fresh, and the avocado made it very creamy, adding to the flavor.This dish was tasty so we were thinking things were looking up, but then an array of what were the worst items of the night followed. We just couldn’t understand Catalan spinach, apple, pine nuts, raisins ($8). It reminded us of frozen spinach — tasteless and bland. The apple, pine nuts and raisins just made a strange pairing for the vegetable. Nobody at the table liked this. But the worse was yet to come. Boneless chicken wings with green olive purée ($9) was just mind-boggling. We couldn’t even figure out what it was until one of my friends (who absolutely abhors chicken) proclaimed that it was chicken. We were thinking it was something a little more exotic, like pigeon perhaps, or even quail. But alas, the server informed us it was boneless chicken wings. There was laughter of disbelief from some of the people, but the consensus was mutual — everyone disliked this dish tremendously! 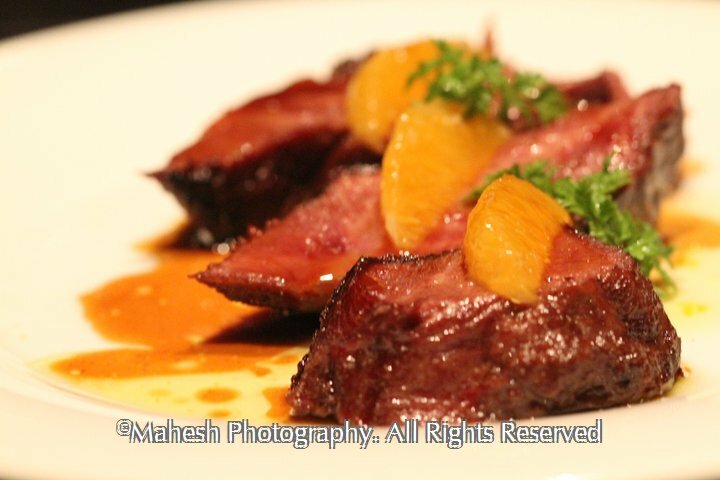 Next was the braised Wagyu beef cheeks with California Citrus ($18) but they sous vide the Wagyu a little too much. The meat was mushy and reminded me of meat from one of those vacuumed packets you’d find at the supermarket. We were all flabbergasted at this point, most of us shocked that a perfectly good Wagyu was treated in this manner. Two pieces were left and no one wanted it. Ironically, we had chicken again and we were told that it was seared chicken sous vide with dates, mustard caviar and spicy mustard greens ($10). After the beef, I was very skeptical about another sous vide item. Although it was better than the Wagyu, the chicken was so-so despite the pleasant acroutrements. After four disappointing dishes, we were not looking forward to a fifth, but luckily, Chipirones en su tinta ($10) arrived. Baby squid with own ink was nicely flavored, but Holly, who has lived in Spain for 6 months commented on how these were the biggest baby squid she’d ever seen. We laughed it off to how everything is bigger in America and let it go at that. I enjoyed them even though they weren’t as delicate as they should’ve been. Papas Canarias, salty wrinkled potatoes served with a mojo verdé ($8) was tasty but wasn’t unique in any way. 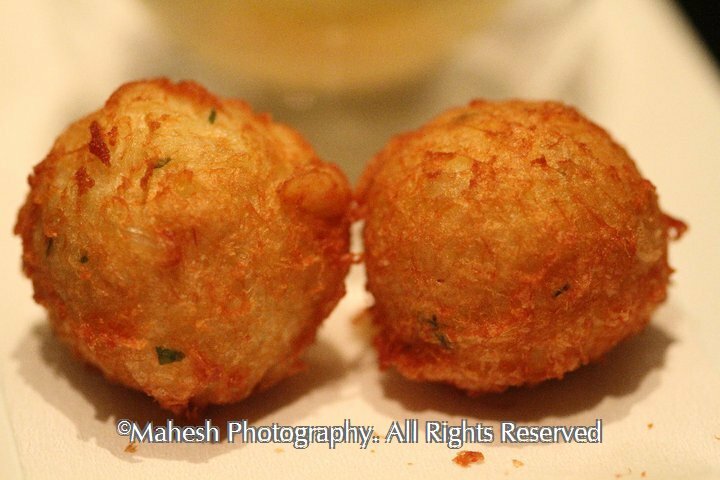 Neither were the Buñuelos — codfish fritters — served with a honey aioli ($9). I love codfish and these looked good, but the exterior wasn’t fried to perfection making them soft and texturally dismal. I was very sad. By now we were all dying to finish up our meal and move on to dessert, but we had a few more courses yet to come. Next on the list was the Tortilla de patatas “new way” * ($5/per person). 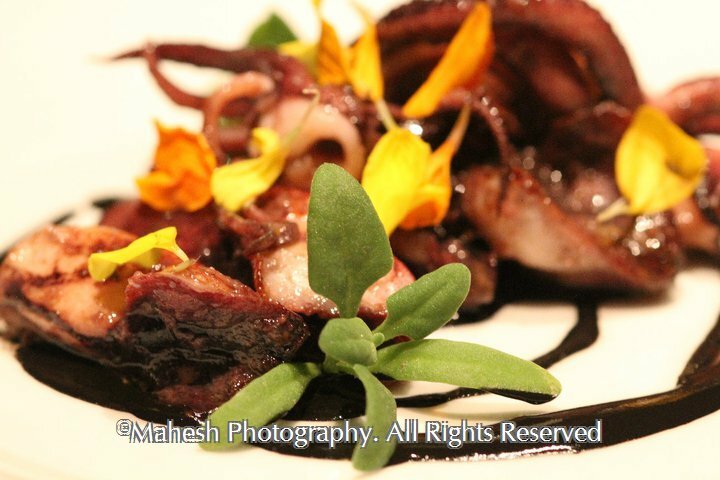 This was one of the items we ordered in addition to the tasting menu. This is served similarly to the caviar egg at Melisse except it was potato foam, egg cooked to a perfect 63 degrees and caramelized onions. Thank god this was pretty good. Those of us who ordered this supplement were pleased with the result. Not caviar egg, but still, decent enough after the string of shockingly disastrous courses we had to endure. 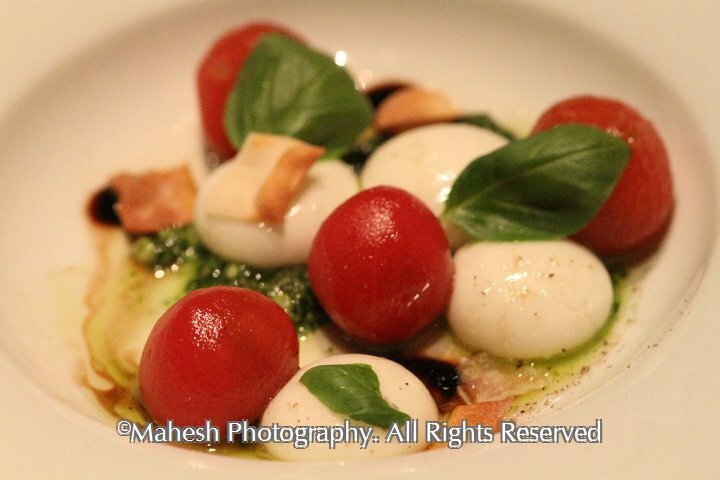 One of my favorites of the night was Not-your-everyday Caprese, cherry tomatoes, liquid mozarella ($12). Little balls of cherry tomatoes and mozarella were filled with an air pocket, if you will, which created a perfect sensation in your mouth when you bit into them. I loved it so much I took the one remaining portion left on the plate. This is one of my top 5 items of our 18 course meal. Green asparagus tempura ($9) with a romesco dipping sauce was again very average, something any ordinary Japanese restaurant is able to create with no problem whatsoever. I guess the only thing which sets it apart from a Japanese dish is the ubiquitous Spanish dipping romesco sauce. Sautéed wild mushrooms ($12) with hazelnut praline topped with micro chives was a strange dish. I’m not sure I liked the hazelnut praline although I liked the wild mushroom medley. However, again, someone pointed out that sauteed mushrooms was something all of us have had elsewhere, so it wasn’t anything unique. I’m glad they saved the best for last so to speak. 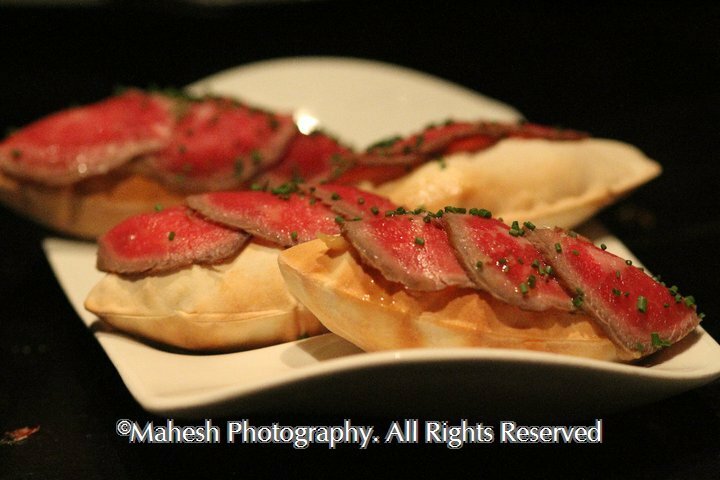 “Philly cheesesteak” was definitely one of the top fives of the night. Thin bread with air pockets filled with melted cheddar was topped with slices of rare Wagyu beef ($8/per person) and was absolutely DELECTABLE!! I think we were all in agreement that we would’ve been happy eating five of these and calling it a night. Last but not least, our second supplement item was Cotton candy foie gras ($5) — I’m glad they kept this as the last item. I’d been waiting to try this forever. 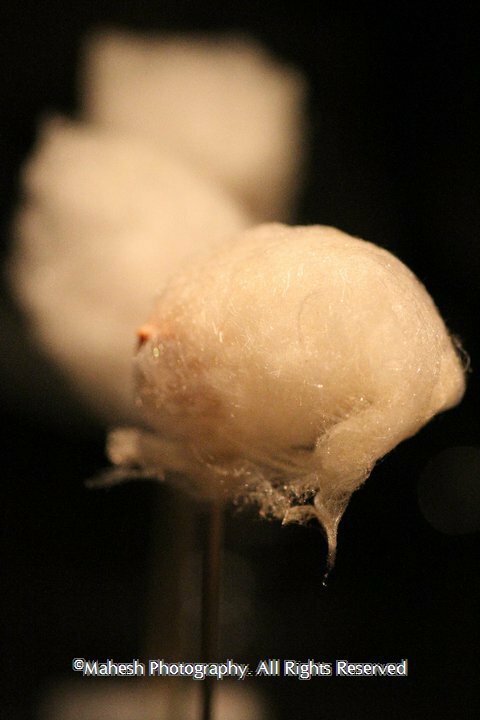 A small piece of foie gras is placed on a stick with cotton candy spun around it. The sweetness of the cotton candy paired perfectly with the soft rich flavor of the foie gras. We moved to the “dessert” room for our desserts — which I’m not going to go into. We had ordered some champagne which didn’t arrive until towards the end of the meal. I think our server was perhaps not the most well-trained, nor was she knowledgeable about our questions. Each time we asked her something, she had to go “find out” the answer, sometimes, not returning with a reply. Our evening was not what we had hoped for and I tweeted our experience the entire evening. Still, I was very shocked and humbled when Chef Jose Andres himself tweeted me back apologizing for our evening and personally inviting me back as their guest. Therefore, Holly and my second visit to The Bazaar will be featured in Part II of my Bazaar experience to be posted at a later date. >wow…i can't believe you still remember all the dished we had that night!did you have a chance to go back? hope it was much better! >Gil: thank you for that link. I will definitely go check it out if I'm ever in that area. Thanks for reading!